The Victoria Music Festival Association was incorporated in 1927. 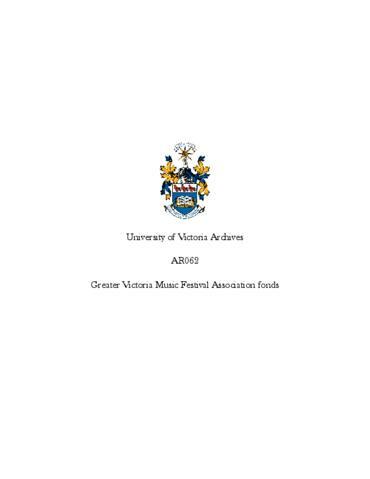 In 1950, the society was renamed the Greater Victoria Music Festival Association. The signatures on the 1950 constitution include: J. F. K. English, President; Mary Campbell, Secretary; William Harrison, Treasurer; E. M. Jackson, 2nd Vice-President; W. W. McDuffee, 1st Vice-President. Since 1927, the purposes of the society have been to promote and arrange competitive and non-competitive festivals in music and other cultural activities; and to engage in activities to develop the musical ability and appreciation of good music and allied arts. Fonds consists of the following series: Constitution, 1950-1981; Correspondence, 1959-1974; Financial ledgers, 1926-1960; Meeting files with minutes and reports, 1950-1983; Scrapbooks of newspaper clippings and annual reports, 1935-1939; 1980-1989. The meeting files include financial statements.